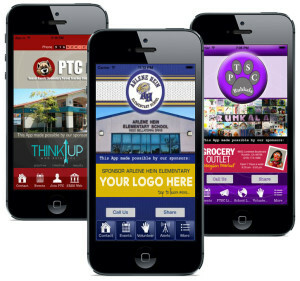 Many of our apps are supported by sponsorships from local businesses. These businesses show their support for education and pay a nice sponsorship fee in exchange for some screen real estate and exposure to their target market…local families. In many cases, it is these sponsorships that make a school’s custom app a possibility. While these sponsorships are seen on the apps’ home screens, Push Notifications are a great way to show some sponsor love and explain the importance of sponsors with your users. Generally we see schools increase their sponsorship rates year to year, and if you want to keep your sponsors and get them to pay more, make sure you are doing all you can to keep them happy. We suggest sending one to two Push Notifications each month to highlight either one specific sponsor at a time, all the sponsors, or some combination. If the sponsors see their business messaged to all the users and see any increase in their business, they are more likely to renew their sponsorship and be open to paying more. It’s not hard at all to schedule a couple Push Notifications each month and the reward of happy sponsors who will continue to fund your app and financially contribute to your school most definitely makes it worth the effort. Have you Pushed Your Sponsors? If not, it’s time to show your love and appreciation and give them the shout out they deserve!